I just loved coloring this little cutie. In fact, I think I'm obsessed with Sherri Baldy's Besties Digital Stamps. Such fun, creative images for any occasion. This is a card that I did for a Co-Worker/friends birthday. 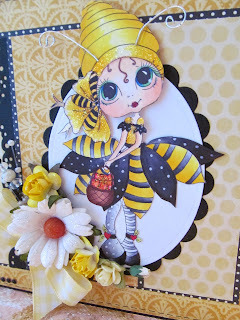 Hi Julie Thank you for your nice comment about my bestie's card I really love this one We don't see it very often and your colouring is just perfect! good choice of papers too! Happy to see that your motivation came back because you're making lovely cards!